We moved into a new house recently, after having lived in an apartment for nine years. Long before the move took place, I told my husband that as soon as the move was complete I would get a dog. Many years before moving into the apartment I had kept Rottweilers. Although many people don’t like them, I think that they’re a misunderstood breed. Moreover, they’re often not kept in the right conditions, or by the right type of owner. I planned on getting a purebred Rottweiler puppy, and I even started thinking of names. One name that kept coming to my mind was Kaiser, so Kaiser it was. About a month after we moved into the house, I sat browsing Facebook. A friend of mine – who also owns a Rottweiler – tagged me in a post from Rottie Rescue South Africa. He commented that I should consider adopting the dog that he’d tagged. When I clicked on the post, my heart almost stopped. It was one of the most beautiful Rottweilers I’d ever seen, and his name was… wait for it… Kaiser! When I’d gone through the selection, approval and introduction process, it was finally time to go and fetch Kaiser and bring him home. Apart from the wonderful folks at Rottie Rescue, I only had three supporters: my husband, my friend who’d suggested the adoption, and my stepfather (a dog lover who was also a military dog handler when he was young). Despite all the negative opinions, I persisted. Kaiser was my dog. To say that the first few days were disastrous would be an understatement. I knew that Kaiser had been waiting for a whole year to be adopted – not because there was something wrong with him, but simply because Rottie Rescue had to find the right person. So, I didn’t know how the “kennel stress” would make him behave. Let’s be clear, Kaiser is a big pooch. He’s three years old, weighs 52 kilograms, and has a set of teeth to match. When he arrived, he had the manners of a six-month-old puppy! While it’s easy to discipline a puppy, it’s a bit different to discipline a fully grown, slightly stressed dog. I couldn’t leave him alone even for a few minutes because I never knew what he would get up to. At times I felt totally overwhelmed. More than once I just sat on the stairs and cried, and asked Kaiser, and myself, what I had gotten into. Quite a few times I considered returning him, but something in me refused to give up. I couldn’t allow the situation to get the better of me. And, when he looked at me with his big doggy eyes, I forgave him and decided to try harder. The days turned into weeks, and the weeks are now almost a month. During this time I gave him interactive playtime and lots of brushing, love and cuddles for at least two hours a day. We do focused training for another hour, divided into 15-minute segments through the day. Patience, praise and treats certainly do the trick. As I’m writing this, Kaiser is at my feet snoring away. He’s learned to lie down, wait, come, catch, fetch, and search. He still has his moments, but he’s mostly well-behaved and follows me like my own shadow. If I hadn’t persevered, Kaiser would have had to repeat the whole process at another home, which would have been traumatic for him. And me? I would have missed out on an amazing dog and a companion who is always ready to give love and just be by my side. 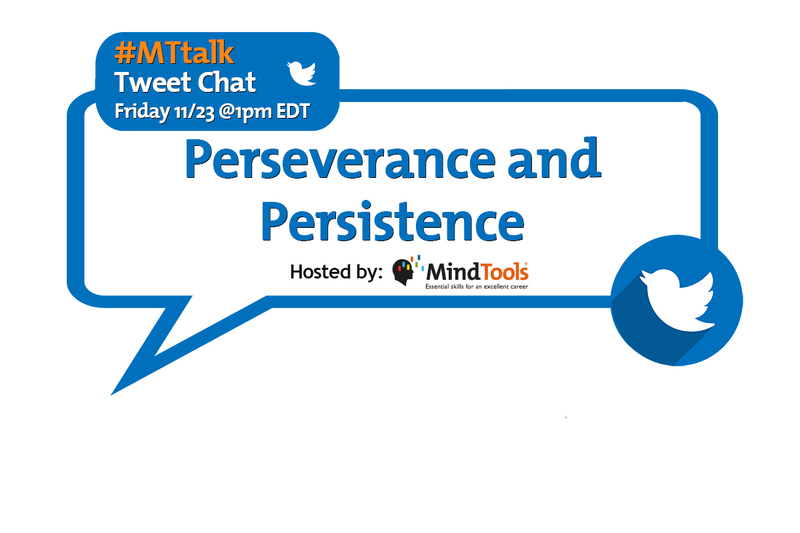 In our Twitter poll this week, we asked what you have trouble persevering with. Fifty percent of respondents said that they found it hard to persevere with fitness programs, while almost 30 percent said that keeping their admin up to date was an issue! Click here to see all the options and the results. • How do you differentiate between perseverance and persistence? • Think of a time when you found it extremely hard to persevere – what made it difficult? • Why was it important to you to persevere? • If there were times when you felt like giving up, what helped you to persevere? • How has persistence paid off for you? • Who or what is standing in your way when you choose to persist? • When is it wise not to persist? • How can you help someone else to become more persistent?